The women’s podium from the 2018 1.3 k World Cup freestyle sprint in Lillehammer, Norway. 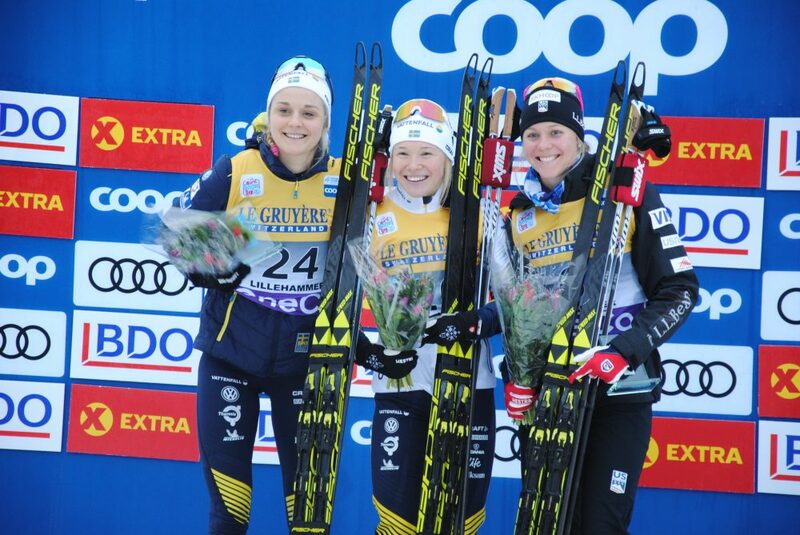 Sweden’s Jonna Sundling (center) won, teammate Stina Nilsson (left) was second, and U.S. skier Sadie Bjornsen (right) third. In Friday’s women’s 1.3-kilometer freestyle sprint in Lillehammer, Norway, the first day of three successive days of World Cup racing, the women’s sprint final was stacked with Swedes, with four of six athletes sporting the yellow, blue, and white. In the final, Jonna Sundling of Sweden passed teammate Stina Nilsson meters before the finish line to take the win in 2:52.74 minutes. It was Sundling’s first career individual World Cup win. Nilsson placed second (+.34), the U.S. Ski Team’s (USST) Sadie Bjornsen was third (+3.03). Evelina Settlin, also of Sweden, placed fourth (+3.82), Kristine Stavås Skistad from Norway was fifth (+6.65), while the day’s fastest qualifier, Hannah Falk, finished sixth (+9.81). American’s Jessie Diggins and Rosie Brennan were knocked out when they placed fourth and fifth respectively in the second heat. The top-four spots in the second heat were separated by 0.42 seconds. Diggins finished the day in 17th, Brennan in 21st. Sweden’s Falk won the qualifier in 2:56.43 minutes. The U.S. Ski Team’s (USST) Bjornsen was the fastest North American qualifier in sixth (+1.88). Brennan qualified in ninth (+3.11), Diggins 12th (+3.66). Ida Sargent (USST) qualified 34th (+7.28), Kelsey Phinney (SMS T2) in 38th (+8.76), Caitlin Patterson (CGRP) 59th (+13.18), and Kaitlynn Miller (CGRP) 73rd (+20.78). The men raced on a slightly longer 1.6 k course. Italy’s Federico Pellegrino, known for his skate sprint flash, won the men’s final in 3:19.17 minutes. On-form Norwegian Emil Iversen was second (+0.44), while Canada’s Alex Harvey, took third (+0.68). Norway’s Sindre Bjørnestad Skar placed fourth overall (+0.91), with Finn Hågen Krogh racing to fifth (+1:07). Finland’s Ristomatti Juhani Hakola crossed the line in sixth (+2.43). Norway’s Johannes Høsflot Klæbo won the qualifier in a time of 3:07.63. Klæbo placed sixth in the first semifinal finishing over thirty seconds back after breaking a pole. Canada’s Alex Harvey and USST skier Simi Hamilton were the only North American men to qualify for the heats. Harvey qualified 17th (+7.59), Hamilton 22nd (+8.72). While Harvey eventually moved onto the final, placing third, Hamilton bowed out in the third heat. Hamilton placed fourth and was unable to advance as a lucky loser. Hamilton finished 19th overall in Friday’s sprint. For Canada, Andy Shields placed 60th (+14.59), Russell Kennedy (Team R.A.D.) 64th (+15.21), Julien Locke (CNST) did not start. The USST’s Kevin Bolger was the next best placed American in 61st (+14.63). Also for the USST, Erik Bjornsen was 63rd (+15.04), Paddy Caldwell 82nd (+19.34). David Norris (APU) placed 90th (+20.71), Scott Patterson of the USST finished in 92nd (+22.21), and Adam Martin (CGRP) 108th (+32.72). Stay tuned for full race reports and you can view our Lillehammer Triple course preview here.